When Gerry wrote a letter to a stranger serving in the US Navy in World War II, she had no idea she'd find a lifelong partner. 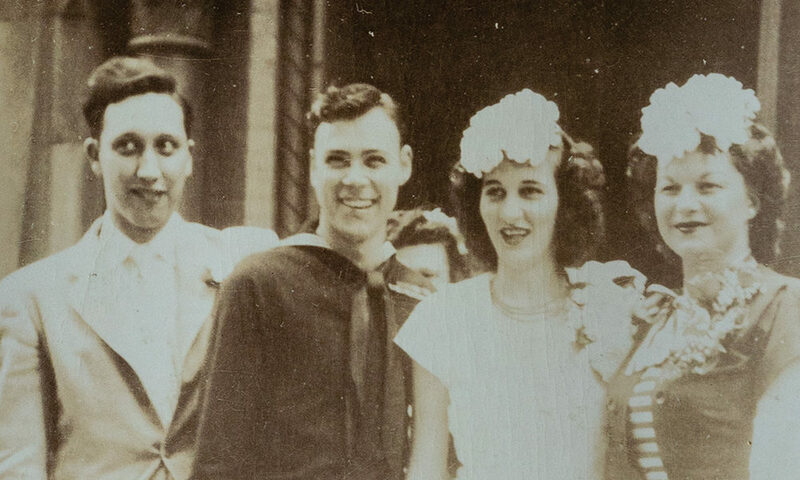 Bob and Gerry Belisario (center) on their wedding day in Albany in 1946. “It was 1942, the war was on, and I was in the service,” Bob begins. (He’s telling the story, notes Gerry, because he has a better memory.) Gerry was still in high school in Schenectady, so she wasn’t old enough to be a part of the war effort yet. But she and her girlfriend wanted to pitch in in some way, so they decided to write letters to soldiers. They contacted a woman who knew quite a few from the area, and she gave Gerry Bob’s name, since she couldn’t pronounce it. (Belisario, that is—not Bob.) At the time of Gerry’s first letter, Bob, an Albany native, was in transit from a US Navy hospital in California to one in Panama, where he ended up receiving the missive. He responded, and the two quickly began a regular correspondence. They mostly wrote about what was going on in each other’s lives—Gerry, about what was happening on the home front—and what the future had in store for them. It turned out that they were both avid roller skaters (“at different rinks, of course”), so they connected on a more personal level too. As time went on, the letters took on a new flavor. “I thought, ‘This guy seems to be very romantic, but holy jeez, he doesn’t even know what I look like!’” Gerry interjects. “And then she sent me a photo of her in a sweater—” Bob starts. “I’m going to hit you over the head!” Gerry says pointedly. 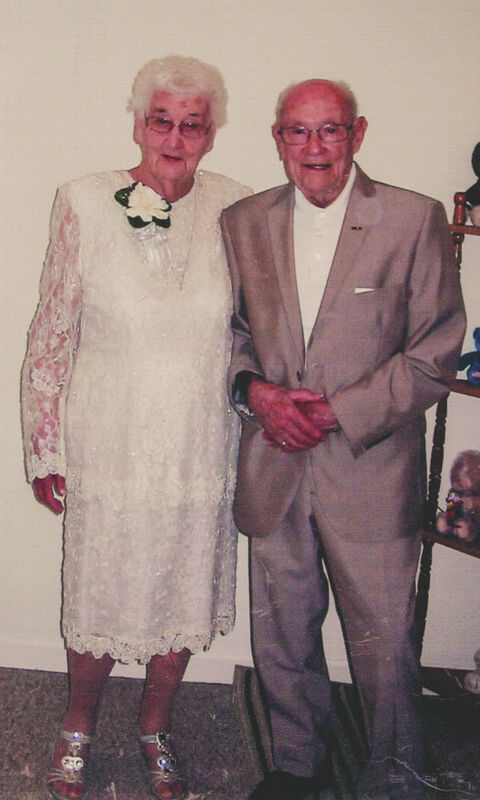 Bob and Gerry Belisario on their 70th wedding anniversary in 2016. In November 1943, Bob was granted a 30-day leave and returned home to Albany. The two pen pals immediately connected in person and spent almost every day together thereafter. Sometimes they’d go out to eat; other times they’d park by the train tracks and watch the trains go by. It was during that month—if Bob’s memory serves him right—that he gave her a ring. Over the next two-and-a-half years, Bob only made it home one more time, before returning to the US for good in March 1946. On May 25 of that year, he and Gerry were married at Saint Paul’s Episcopal Church in Albany. Bob remained in the service for two more years following the couple’s wedding, and he and his wife would eventually have five children, eleven grandchildren and, they think, nine great-grandchildren. (“I’ve lost count,” Gerry says.) Gerry’s a Civil War buff, so she and her husband have been to many of the war’s historic sites, including the exact spot in Virginia where Bob’s great-great-grandfather was wounded during the war. “Oh, my heart bleeds for you,” Gerry replies, sarcastically. “She lets me think I’m the boss,” he retorts. “You are the boss…but only because I let you be,” she says. Full disclosure: I’m a sucker for a good love story. Twilight? Made me swear off boys who aren’t vampires. Titanic? A 22-year-old Leo. Dear John? Cried through it all. Twice. But talking with Bob and Gerry is different. If a film were to be made about them, it wouldn’t be a mushy-gushy romance based on a book written by Nicholas Sparks. It would be the story of two people who met in a pretty amazing way, were attracted to each other and then figured out how to make the next three quarters of a century work. It’d be part drama, part romantic comedy, part boring documentary, because that’s what marriage is: long stretches of time when, to quote Bob, you’re just putting up with each other, sprinkled with the moments love stories are made of. So to amend my previous statement—Bob and Gerry’s story isn’t the greatest love story ever told. It’s the greatest real love story ever told. And if, 72 years from now, I’m half as happy as the two of them, I’ll count my story as pretty great too.